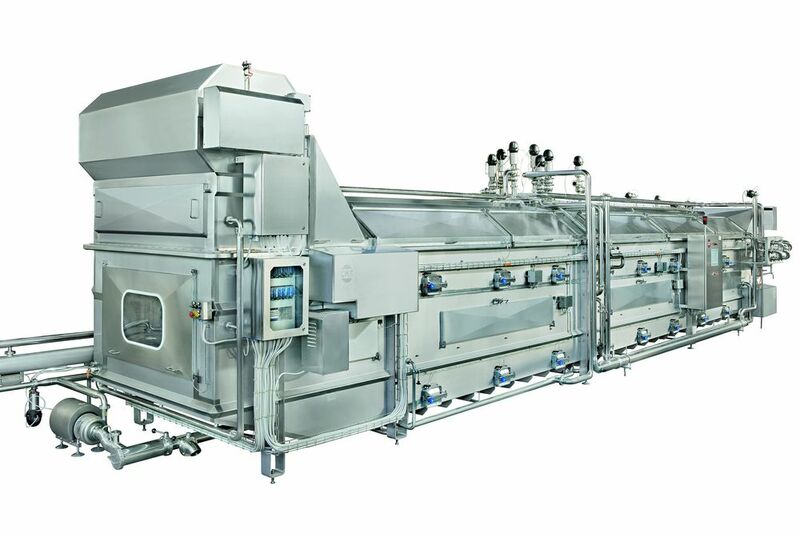 GEA-CMT produces single- and double-level brine and firming tanks for spun curd cheese production. Designed according to the required cheese size, hourly rate and space, they can be linear, orthogonal or U-shaped. For customers who have space problems, there are two- or three-tier tanks with internal product raising systems. The modular Aisi 316 or 304 stainless steel system is composed of roughly 4 metre-long sections assembled with flanges and bolts. The sections form a single structure, which includes the cover; the bottom of each section is bevel-shaped in the center, where the water drain is connected to the recirculation pump by means of a single collector. Product handling in the tank occurs via brine jets or water-cooled oscillating mats. To ensure cooling, the water or saline solution is continuously drawn in by means of a centrifugal pump, sent to a plate heat exchanger and reintroduced into the tub through dedicated pipelines. The movement of the product can be handled electro-mechanically or via a PLC touch screen.